John and Liz Smith are the co-managers and trainers at Iron Horse Ranch Quarter Horses, as well as doing all the mucking and hauling. Both of them have a love for horses that goes back to childhood. Both remembered that love and actually started owning and training horses much more recently, in 1998. They have attended numerous clinics with professional trainers, done much reading, and had a lot of seat-of-the-pants experience since then. 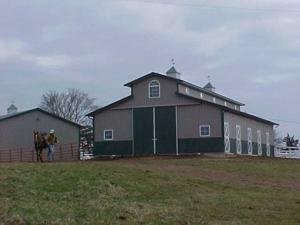 They are members of AQHA, APHA, Back Country Horsemen of America, and the Moniteau Saddle Club. Their proudest accomplishment at Iron Horse Ranch is a happy pasture!